Posterior impingement is due to over use and repetitive forced extensions of the elbow. This may occur during sports, such as overhead racket sports, throwing, swimming and boxing. With repeated extension (straightening of the elbow), the olecranon tip is repeatedly jammed into the fossa at the back of the elbow, which results in inflammation of the joint lining (synovium), proceeding to injury to the cartilage and bone. Bone spurs may sometimes form on the tip of the olecranon leading to further injury and soft tissue impingement. There becomes increased risks of impaction and injury when there are shearing forces that occur as at result of a valgus strain (strain that opens up the inner side of the elbow), such as during serving and hitting topspin forehands with an extreme wrist and grip in tennis; similarly, this may occur with badminton. Two types of posterior impingement are recognised; posteromedial impingement syndrome and posterolateral impingement syndrome. The typical symptoms are pain and tenderness at the back of the elbow, especially when trying to throw, straighten the elbow, or during serving and overhead racket shots. This may proceed to locking and a catching of the elbow. There may be swelling of the elbow and inability to serve at full speed. There may be some elbow stiffness and towards the late stages an inability to fully straighten the elbow. 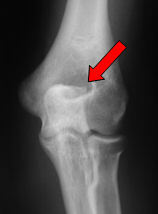 Investigations such as x-rays may not adequately reveal the diagnosis unless there are spurs or loose bodies in the back of the elbow. Ultrasound scan and MRI scan may be useful in expert hands. Hemiarthroplasty of the elbow is the replacement of one partof a native elbow joint with a synthetic elbow joint (usually made of metal). Usually the surgery involvesreplacement of the end of the humerus (upper arm) bone at the elbow joint. When is hemiarthroplasty surgery recommended? The only indication for a hemiarthroplasty is elbow traumawhere the bone is broken so badly that it cannot be fixed in the usualway. This procedure is usuallyonly recommended in more elderly people who may have fewer demands of theelbow.